When you live near water, there’s one constant come summertime: BUGS. I admit it, I LOATHE bugs. Flies, ants, and especially spiders. There must be millions of different species of spiders. Some I can take, and some I can’t. Daddy Long Legs don’t bother me so much. They don’t seem to want to be around humans and I cut them a lot of slack—until they get too close. I’ve been known to let them live in the bathroom for days as long as they didn’t come near me. They come and they go. I like it best when they go. And then there are the black spiders. Despite the fact that this type of spider has very short legs, they RUN VERY FAST (and they have good hearing because they run when they hear me scream). Last week, I was terrorized by (what I think was) the same spider two days in a row. There I was, relaxing on the couch, watching a DVD of Boston Legal, when Mr. Spider ran up the wall. Of course, I leapt off the couch screaming and ran to the kitchen to grab my spray bottle of peppermint oil in water, which my neighbor assured me would “deter all bugs and even mice.” Yes, it has done a great job, but it needs to be reapplied on a regular basis. It’s also poisonous to cats, but since we are currently catless (and I wish it weren’t so), I’ve been using it liberally. So, squirt, Squirt, SQUIRT. There, Mr. Spider, take that. I thought I got him … but I was wrong. Not 24 hours later, there I was watching Denny Crane and Alan Shore being buddy-buddy when I looked down and GAK!!!!! Mr. Black Spider was running on the side of the couch WHERE I WAS SITTING—AND WITH SHORTS ON!!! I whipped off my shoe and starting beating the couch half to death, and then sprayed it thoroughly, but I wasn’t sure I got him. So then I sprayed all around, under and behind the couch. Of course, I nearly choked to death from the pungent odor of peppermint (which isn’t fun and Christmasy in such high concentration) but I hoped I got him (or her). So it’s been a few days with no sight. But he—or his siblings or children—will be back. 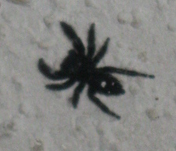 Is it any wonder that I search the walls before I go to sleep at night, and I turn on the light when I go to the bathroom during the night because – I don’t want Mr. FAST-RUNNING SPIDER to run across my foot, or god forbid be sitting on the toilet paper roll (and, yes, that has happened). I like to think of myself as a pretty self-sufficient woman who can handle just about anything. But when it comes to spiders—all bets are off. Are you unnerverd by arachoids and scream in terror, even if you are a million times bigger than they are? PS - A REEL CATCH is now available in Trade Paperback and ebook.